Treehugger recently reported out on the Top 10 Droolworthy EcoStructures, and I absolutely agree with their top #1 choice. The Dragonfly is a 2,000 foot tall strcture that is Belgium-designed along with a 128-foot vertical farm that is so very eco-chic. 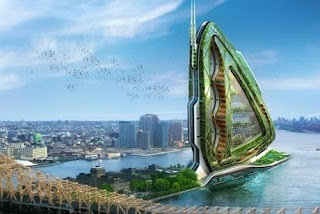 It comprises two towers that incorporate wind and solar technology for harnessing energy, while it’s wing-like, exoskeleton, dragonfly structure supports the greenhouse and gardens. The exterior vegetation allows for rainwater filtration and recirculation. It truly is a self-sufficient design that is progressive, innovative and a mind-blowing icon. Read more here about the inspiration for the design based on the agriculture challenges that are present for many urbanites.